2016 is a great year for Black Sheep Restaurants, its new ventures populating headlines and dining neighborhoods from Soho to Star Street precinct. After the successes of Belon, Buenos Aires Polo Club and Le Garcon Saigon comes Soul Food Hong Kong, the sister restaurant of food writer Jarrett Wrisley’s Soul Food Mahanakorn in Bangkok. The new Soho opening resides in a small space opposite of Belon. The narrow strip of dining space gives off a vibrant vibe with warm lights from the iconic green lamps hanging from the high ceiling. Tables are rather closely set along the room, with just a narrow corridor separating the guests from the open kitchen. When the restaurant is full the blazing sounds of the stove, it may be a bit noisy but this mimics an authentic street food experience. 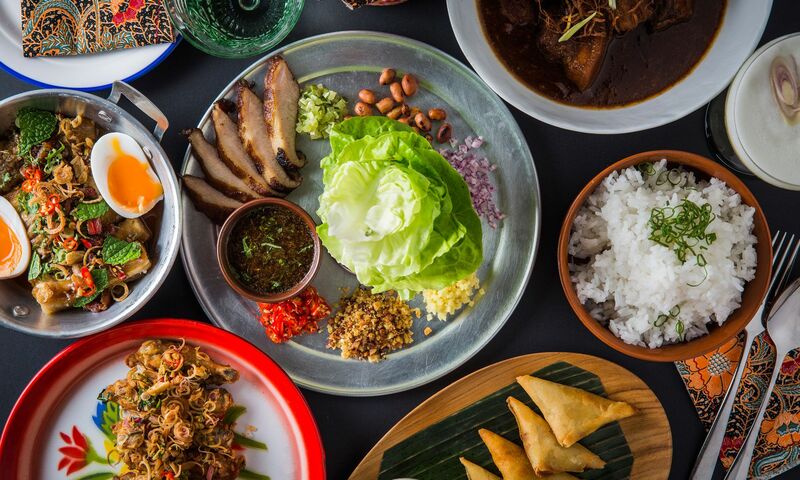 Inspired by street eats in Thailand, Black Sheep Restaurants’ latest opening joins the wave of Thai newcomers this autumn after the successful Samsen and Apinara. The menu features a modest selection of dishes, from snacks to meaty mains. We began our meal with the restauant’s signature fish sauce chicken wings, where each wing is halved and marinated in fish sauce and deep-fried until golden brown. The cashew and lemongrass salad on the top enhances the crunchy texture of the starter. The smoked duck and shiitake mushroom larb is a spicy salad of house-smoked duck, chopped fine with a generous helping of mint and coriander. The meat is best enjoyed on fried cassava chips, served on the side. The Yam Makrua Yao, or aubergine salad, takes grilled aubergine smoked with sugarcane, which gives the vegetable extra sweetness, and there's richness from the molten duck egg yolk dressing. Mains are also great for sharing. The sticky tamarind ribs are braised with a tart tamarind-based sauce, although the ribs can take a little more cooking to become more tender. The Gaeng Penang, a braised beef cheek curry, is rich and aromatic, thanks to the addition of coconut cream and burnt pineapple. The fork-tender beef cheek is also great with steamed rice, served on the side. Those who fancy carbs with their curries should order the crab fried rice, where brown jasmine rice is tossed with lump crabmeat and charred corn, served with two sauces: a chilli-spiked fish sauce and a green herbed dressing. The coconut ice cream was sold out on our visit, but Soul Food Hong Kong has prepared some backups just in case. We chose the sataya, or steamed pumpkin pudding. The restaurant’s version replaces the steamed custard with vanilla panna cotta, a lighter alternative sets against the creamy miniature pumpkin. Compared to the high calibre of Black Sheep Restaurants beverage lists, the one at Soul Food Hong Kong is considerably weaker in comparison despite wines by the glass options are in abundance, the group’s signature cocktail selection is still very diverse, with an occasional cocktail du jour on offer. The mixology team’s offerings tend to be on the sweet side, the Bun Bang Tai, marry tequila, lime, chillies and egg white, creating a frothy concoction that is refreshing but too sweet to match with the dishes. The Tai Yen Yen looks great, with flavours such as tangy passion fruit and pineapple to refreshing cucumber and lime, laced with ginger ale and gin, turned out to be a good drinkable dessert but also on the sweet side to enjoy throughout the meal. Service at Soul Food Hong Kong is impeccable. From the moment you walk in the staff are all smiles. A detailed description for first-time visitors is given with good explanation of dishes, from origins of offerings to sound cocktail pairing. Portion control is impeccable, and its timely service between filling glasses and changing plates show attention paid to each table. A complete dinner for two including one cocktail each amounts to a little over HK$1,150. The service is superb at Soul Food Hong Kong with fine execution of its dishes, a fine sample of tastes from the bustling streets of Thailand in Hong Kong.